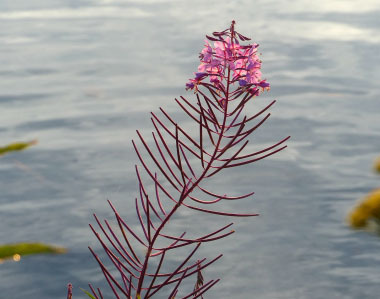 Fireweed is a native plant that’s found throughout the temperate northern hemisphere including some areas in the boreal forests. It earned its name because this plant is the first colonizer in the soil after forest fires. In Great Britain it also earned the name bombweed due to the rapid colonization of land that was bombed during WWII. 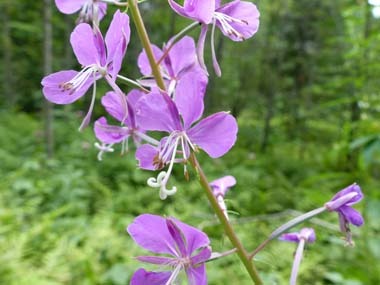 Fireweed is an important plant for honey producers as it attracts the bees and hummingbirds as well. This beautiful plant is a member of the Evening Primrose family (Onagraceae). 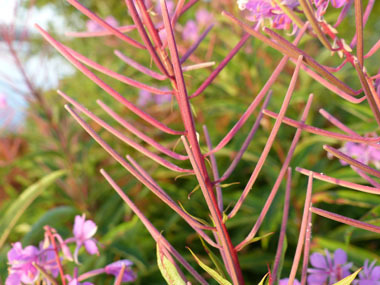 Distinguishing Features: Fireweed is a very attractive flowered plant that tends to love disturbed places. Fireweed commonly goes by the Latin name Chamerion angustifolium but it is also known as Epilobium angustifolium in some areas. There are two varieties in North America: var. angustifolium and var. canescens. Var. canescens is not as common and it generally is a larger plant, more hairy, the leaves have distinct venation and the stalk is much shorter. Some people know this plant as rosebay willowherb or the great willow herb. Flowers: The inflorescence is a terminal raceme of many flowers. Individual petals are rose to purple in colour. The four petals may measure from 8-20 mm long. The four sepals are narrowly lanceolate and about 25 percent shorter than the petals. The stamens are slightly shorter than to nearly equal in length to the stigma, which is cleft into four long lobes. The white filaments terminate in large red anthers. 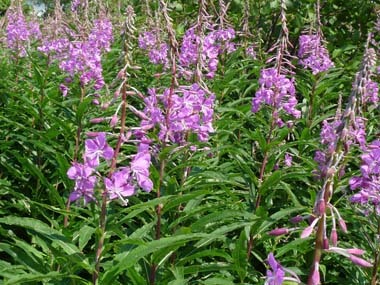 Fields of Nutrition has medicinal benefits and vitamin/mineral content of Fireweed. 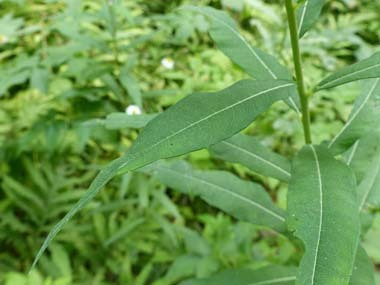 Leaves: The leaves are alternate, narrowly lanceolate and they measure up to 15cm in length. There is a white central vein on most leaves as well. 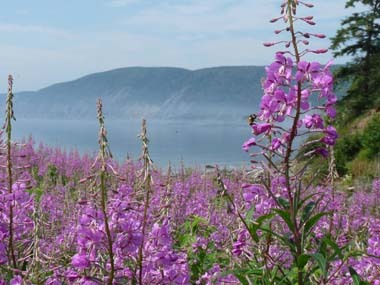 Habitat: Although fireweed tends to grow in all types of soil it prefers well-drained soils. 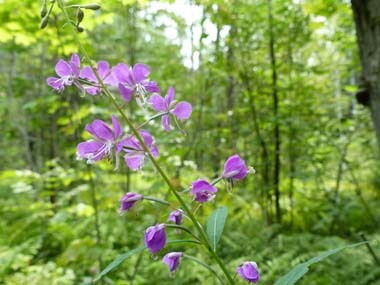 Fireweed can grow in semi-shaded forested areas and in sunny meadows. It likes rocky ground, waste areas, woodland edges and it can be grown in a garden. 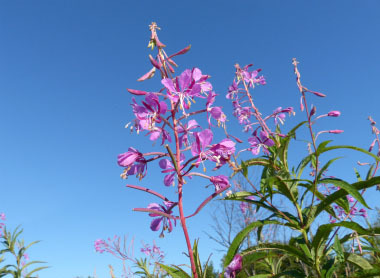 Fireweed also grows along highway and railroad embankments but it prefers disturbed areas. Edible parts: Young leaves and shoots can be consumed. They can be used in salads, as a vegetable, and young shoots can be used as an asparagus substitute. Older shoots become too tough to ingest. The root can be roasted after scraping off the outside, but often tastes bitter. To mitigate this, the root is collected before the plant flowers and the brown thread in the middle removed. Flower stalks can be consumed raw or cooked and are used when the flowers are in bud. The pith of young or older stems are consumable raw or cooked.